I am sick today. There seems to be a bug going around, and somehow, I caught it. I coughed all of yesterday – miserable, tight-chested, and painful. I slept for ages this morning, woke up and decided I needed some soup. But when I went to the kitchen, all I had was 3 onions … A very sad state of affairs, but I was planning on shopping today! And instead, I am sick! 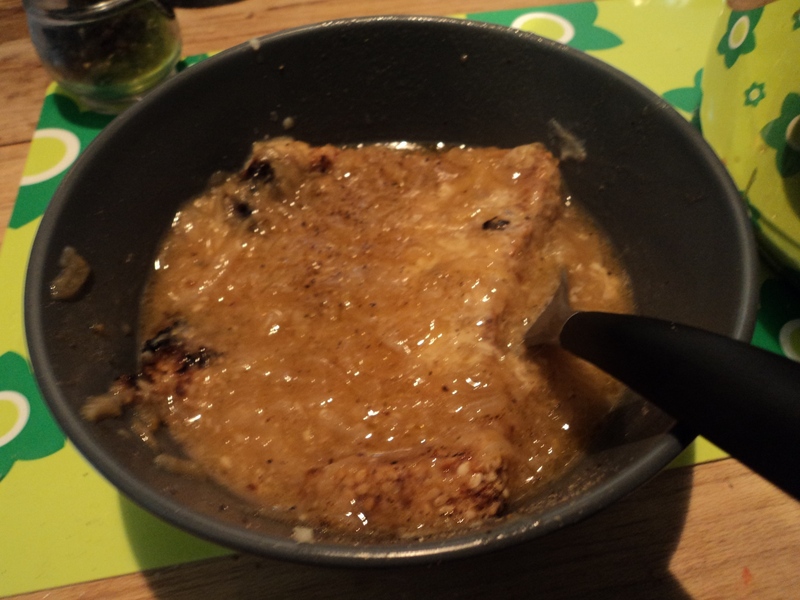 So I decided to make a French Onion soup. This is not a fancy one, with toasted bread rubbed with garlic, and gruyere cheese. Its basic, simple, warming and deeply comforting. If you have cheese, grate some over your toast, but if you want to keep it vegan, dont add any cheese (or butter in the beginning) at all. It will still taste delicious, and reach all those cold miserable places. This makes about 4 servings of soup. You could easily double it for a dinner party, and toast a baguette, and pile over some stringy gruyere. Broiled in the oven, its a decadent feast – but when youre sick, as I am today, its just too much effort. 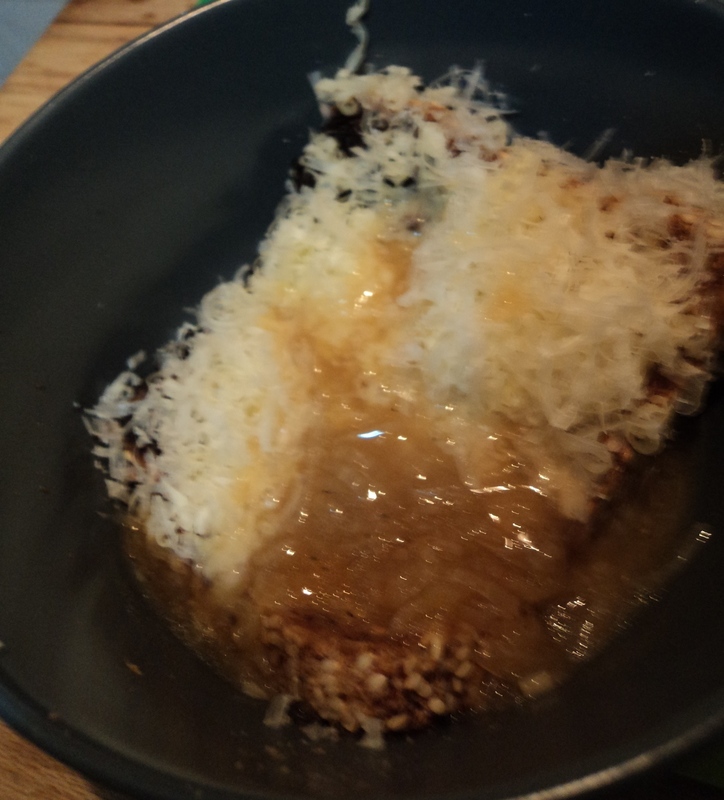 I toasted a really lovely dark brown slice of bread, placed it in the bottom of the bowl, and grated some parmesan and cheddar over – its what I had. I then ladled the soup over, and allowed the bread and cheese and hot oniony soup to meld and interact. Beautiful. Comforting. Peel the onions of their brown skin, and slice really fine. I used a mandolin for this job, and it was fast, easy and really exact. If you dont have one, use a sharp knife and try and get the onion slices as fine as possible. Place a medium saucepan over medium heat, and warm the olive oil and butter (or just olive oil) until the butter has melted. Add all the onions, and stir to coat the onions with the oil/butter mixture. Turn heat down to medium low and saute the onions until well browned for at least 20 minutes or so. This is the ultimate trick to this soup – you need to be really patient with the onions. They need to cook and cook and cook until they are deeply brown because this is the basis of the flavour and strength of the soup. They will let go of some liquid, this is fine, and then they will get glossy and soft. Keep at it. They will start to turn golden, stir a little and let cook further. You want a deep dark brown – teak or coffee with a touch of milk colour. If you prefer a lighter soup, obviously, you can let the onions go only to light golden, but you will miss the deep layered flavours that you would get if you keep your nerve and just keep cooking them. Without letting them burn! And you dont have to stir all the time. The occasional stir is fine, whilst you make yourself a cup of tea, play with the cat or take some vitamins. Let the onions do their own job. Just keep the heat low and steady, and stir sometimes to make sure nothing is burning. Once the onions are cooked to your liking, sprinkle over the flour and stir well. Cook for a few minutes to allow the flour to amalgamate with the onions and fat. This will ensure a creamy thick soup without a raw flour flavour. Pour over hot vegetable stock, stir well, semi cover the pot and allow to simmer for about half an hour. Taste, add some pepper and a touch of salt. Meanwhile, toast your bread till quite dark. Place in a soup bowl (you might have to shove it in there, this is fine), and grate some cheese over. Not too much as it can be overwhelming, but enough to add flavour and interest to the soup. Ladle hot soup over the toast and cheese just to cover, and allow to sit for a minute so that the soup and toast and cheese get firmly acquainted. Serve to those needing comfort.